We've added a couple custom fields to our Opportunity object. They are both required fields and management does not want any default values. How can I get these fields onto the Mobile App's "New Opportunity" screen? I can't seem to find it. I've added them to the compact layout and can see them in the mobile app, but users cannot create new Opty's on the mobile app since they don't have access to those fields when they create a new record. Then, you should be able to add your fields here. Can anyone please explain to me as to what is the difference between Salesforce lightning and Salesforce1 App, or how are they related? Salesforce.com Introduces Salesforce1. Salesforce1 is the new social, mobile and cloud customer platform built to transform sales, service and marketing apps.Salesforce1 is the first CRM platform for developers, ISVs, end users, admins and customers moving to the new social, mobile and connected cloud. Salesforce1 is a brand new app which replaced Salesforce Chatter and is what most of the current Salesforce buzz surrounds. 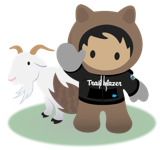 In theory it'll allow you to make use of ALL Salesforce functionalities from your mobile, including all custom objects, apps and even Visualforce pages. It's also feed-first, so Chatter is central to it. Lightning Experience, the new, fast, beautiful user experience from Salesforce. With a sales-centric mindset, we focused on reinventing the desktop environment to better support your sales process. The result is an intuitive, intelligent interface that helps sales reps work more naturally and close more deals faster. It’s really just the beginning! Lightning Experience will transform Salesforce CRM and extend to service, apps, platform, and more. No matter what department you're in, we understand that the way people work is changing. All this change is greatly influenced by the rise of mobile. Sales reps at your company are already using mobile to research prospective customers, get directions to client meetings, connect socially with customers, and more. We get that. That’s why Lightning Experience takes the cool stuff from the mobile experience and brings it to the desktop. Salesforce1 is using same framework for user interface like lightning but both are dieffrent. I'm trying to embed a Wave dashboard onto the Account layout so I can provide my Sales Reps some sales insights when working on existing customers. We have noticed that even though we have tried to add the dashboard as a Lightning Component and as a embedded Visualforce page onto the standard layout, when logging in using an iPad ot a phone, the Wave dashboard doesn't appear at all. Is there any possible workaround without having to navigate away from the record? @Alberto, I thought I'd try the Visualforce route even though you flagged it didn't work and I've had some success. I followed the information in the link below. I've deliberately kept the vf simple just to get it working, I've taken out the filter section but I don't see why this shouldn't work if I have a valid dataset, I'll have a play with this next. The issue I'm having now is that the faceting doesn't work in mobile, well it does but when you click on a part of the donut for example it opens the dashboard in another page, it doesn't update dynamically on the fly as it does on the desktop. I have downloaded the lightning for gmail extension and it works great on my desktop. But I want my users to be able to access this gmail integration with Salesforce on their phone. Does anyone know of or recommend an ios app or solution where my users can log an email, create a new lead etc. to Salesforce through gmail on ios? Check out Salesforce Inbox (https://itunes.apple.com/us/app/salesforce-inbox/id1208232122?mt=8). Hope this helps! I am trying to create a custom field on Activity object of the datatype test area long or text area rich.But am unable to find those two datatypes. Those two datatypes are available on other std objects but its not present on Activity object. You can't create this data type field on Activity. You can promote and upvote this idea here Allow custom "Text Area (Long)" fields on Activities. Log Salesforce Inbox read receipts to a Salesforce record? Our sales team is using Salesforce Inbox and getting read receipts when sending emails to leads. Is there a way to pass those read receipt flags into a Salesforce record? Hi Gordon - Read receipt flags don’t pass into Salesforce at this time, but your sales reps will be able to see read receipts in folders via the Outlook add-in and the Chrome extension. Recommend submitting this as an idea on IdeaExchange! Its correct to say, that its possibel to login in Salesforce by browser on your IOS or Android? b) on the browser of your cellphone, (i tried this, and its possible, but this don't make sense for me. Hi Natan - yes, its possible and has a purpose. The app has specific functionality, but there may be some features of the full site you want to access. By switching to your mobile browser you are able to switch to Classic mode and gain access to elements that might not be accessible via the salesforce mobile interface. Once use case for this would be for an admin to login as another user to see what their mobile expierence is like. The Admin could login via their mobile browser, switch to Classic, get to setup>users, login as a specific user, and if they are a Lightning User, they will get see that users Salesforce mobile view. Do you know if in SalesForce there is an app similar to Oracle Voice for Sales Cloud? That is, in the mobile application sales representatives can generate appointments and tasks by voice. @Hernan: Unfortunately, there is no built in feature for such functionality. But you can have a look at below AppExchange products. The 'Opportunity Name', 'Close Date', 'Stage' and 'Amount' fields do not appear to be on the new action page layout. Indeed I created that quick action with these fields only, as you can see on the screenshot. Trailhead support advised me to change my language to english and perform the exercise again. this was the solution finally. In lightning,for some of the related list;new button is not getting displayed.For some it is getting displayed. Please let me know what is the actual reason behind this? In classic all the related list have new buttons. But in lightning that is not the case. Have you modified the page layout? Goto>Your object>Page layout>Related List> Related List property>Verify you Add New button Checkbox check there.